The 2018 Subaru Impreza offers something standard that's nearly impossible to find in its compact car competitors: all-wheel drive. But there's more to the Impreza than all-weather driving security. It's fun to drive, with a nicely sorted suspension and sporty exhaust note. It's packed with technology, and roomier than ever. The popular hatchback body available is part of the Impreza's do-anything reputation. My Subaru provides a safe and fun driving experience. I retired a really old Volvo wagon that had served me well, but needed to be replaced. I had heard great reviews from everyone I know who drives a Subaru, so I did some research and test drove a handful of models at a nearby dealership. I needed a hatchback and Subaru has some excellent options. I ended up with the Impreza model, as it had all the features I wanted/needed for my budget. Needless to say, this was quite a step up from a really old and outdated Volvo, especially in terms of technology, safety and in my particular car, I am delighted to say luxury. What do I love about my Subaru? The beautiful cream leather interior- it is gorgeous! I am a junkie for natural light, which we really lack here in the Midwest winters and my car is bathed in sunlight with it is fantastic sunroof. What's really comforting in my Impreza are the safety features and I have to say, I am astounded at what this car can monitor. The safety features, like lane detect and braking sensors and Bluetooth give me peace of mind when my son drives the car. Not that I necessarily would subscribe to this on my own, but the car came with a free trial of Sirius XM, which is pretty cool, also. I have only had my Subaru for a few months, so aside from one small issue needing to take it to the dealership to have software downloaded to correct a recall for an air conditioning issue- a recall for something which I personally did not experience a problem, I can only rely on the testaments of reliability that I have heard from those who also drive Subarus. So far, I super pleased with the performance and handling. It is a really fun car to drive and I am looking forward to the all wheel drive this winter! Love it so much! You can also call people on your car with Bluetooth. This car is great on gas mileage which is really nice out here in California. It is a sportier car, so more of a young person car. Beautiful colors to choose from, I have the teal. The only thing I do not like is that it does not have dual ac which is only a problem when I have passengers because I switch from hot and cold very often. It comes with a sunroof, LCD screen, backup camera, multiple airbags, safety features like lane departure/correction and front cameras for automatic braking, cruise control, manual option with paddle shifters, red stitching for that sporty look, and a spoiler on the back. And the side mirrors have a light bulb inside so when you open your car the lights will turn on and illuminate onto your car so it is easier to see the door handles. There’s also keyless entry, you put your key in your pocket and you slide your hand into the door and it’ll beep and unlock it, you press the handle and it’ll lock it. It is also a push to start. Drives really smooth and handles really well on curves and bends. I love Subaru’s and I love my new car and I would highly recommend it to anyone and everyone. This car has excellent gas mileage. First time owning a Subaru and I love it. Its comfortable, it is spacious, and reliable. I have a long commute and this vehicle makes the drive more comfortable. Infotainment center is a nice upgrade. Oil changes every 6 thousand miles instead of every 3 thousand miles. I love the dealership and the people that work there. I am treated very well and so far I have nothing but good experiences with the product and the company. The car also came with cloth floor mats as well as rubber for bad weather. I liked the colors I had to choose from. I get great gas mileage. I am averaging 45 miles per gallon and sometimes more. 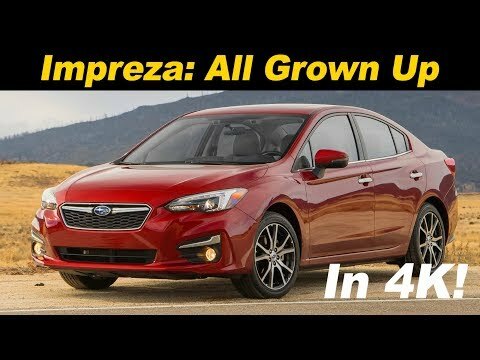 2018 Subaru Impreza Review and Road Test in 4K UHD!